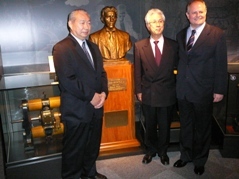 On invitation by the Group of Support of Tesla's Deeds and TEPCO Museum, H.E. Mr. Ivan Mrkić visited the museum and bronze bust tribute to Nikola Tesla, Serbian scientist and innovator, which was presented to the public last June (see the link). Ambassador Mrkić also met with their representatives Mr. O. Hirashita and Director Y. Haraguchi, as well with representatives of Japan - Serbia Exchange Association - President T. Togo and Vice President Y. Hamada, and former Ambassador of Japan in Belgrade Mr. T. Nagai. Museum Director Haraguchi expressed his gratitude for the support of our Embassy, stressing the importance of the establishment of Tesla's statue for the strenghtening of mutual relations and public awarness of Tesla's achievement. This is especially due to the fact that it is the only statue among 16 famous electricity scientists, whose work is part of Museum's exhibition. More than 30.000 people visit this Museum every year, among which the representatives of Imperial family and governmental institutions. Ambassador Mrkić presented to Mr. Haraguchi the envelope "First Day", issued in 2007 on the occasion of Emperor's 74th birthday and of marking 125th anniversary of bilateral diplomatic correspondance between King of Serbia, Milan I Obrenović, and Meiji the Emperor of Japan. Ambassador Nagai also gave a valuable present to the Museum - Egg of Columbus, one of Tesla's inventions, announcing that he will give one to our Embassy to commemorate our cooperation on this project.